What is the principal criterion for participant selection? Which charities can winners select? How frequently does the poll run? When will the poll findings be released? Why was my registration not completed? Who are the current expert participants? How does Vision Prize differ from consensus-based polls? How does Vision Prize differ from betting markets? Are Internet polls inferior to standard opinion surveys? Do incentives create selection bias in the sample? Vision Prize® is a polling platform for capturing meta-knowledge — knowledge about what people know. In addition to assessing the views of scientists, Vision Prize asks its expert participants to predict the views of their scientific colleagues. This approach gives new insight into the level of scientific consensus on various issues, which in some cases may be just as important as knowing the majority view. Charity gift cards — our way of thanking panelists for their participation — are awarded as prizes for exceptional meta-knowledge. 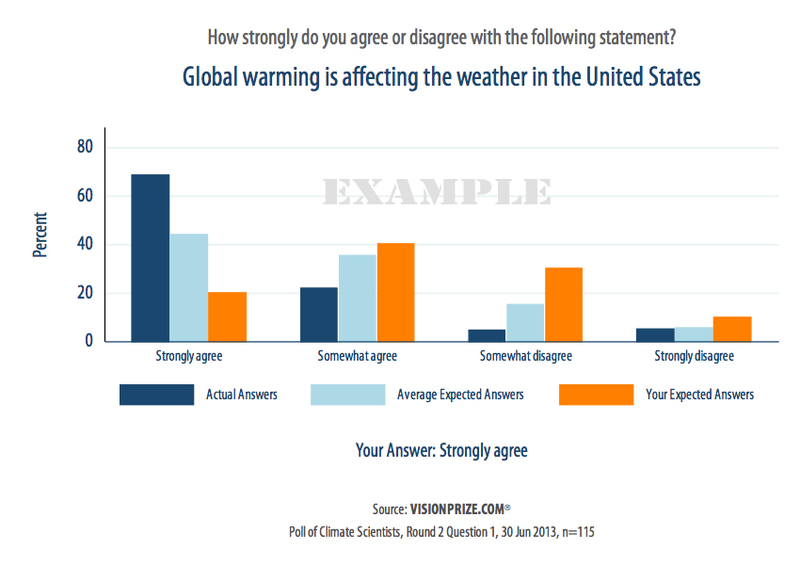 Three-year data collection for our Poll of Climate Scientists ended December 2014, and was run in collaboration with IOP Publishing’s scientific community website, environmentalresearchweb. Vision Prize also is affiliated with researchers at Carnegie Mellon University. Additional data analysis and visualization is currently underway with research partners and collaborators, including IOP. Vision Prize is strictly nonpartisan — we are not an advocacy organization. See also: About. Others with advanced degrees and relevant scientific or technical credentials. Is the prospective participant generating original scientific research in a climate-related field? Charity gift cards — called “Good Cards” — are the sole source of prize funds, 100% of which benefit public charities. Contributions help expand our poll of scientific experts by incentivizing their participation. Top scorers receive Good Cards to support their favorite charity causes and institutions. 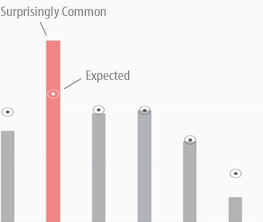 Good Card purchases are tax deductible in the U.S.
With the myVISION feature of Vision Prize, you can compare your predictions of the views of your colleagues to the true distribution among our sample of experts for the most recently completed polling round, as shown in the example below. Each Vision Prize question has two parts — the first part will ask which answer you believe to be most likely and the second part will ask you to predict how all participants will answer. Based on your answers and how accurately you predict the answers of the other participants, you will receive a Vision Score, which is a measure of meta-knowledge. The higher your Vision Score, the more you earn in charity gift cards to support the charity of your choice. Charity gift cards are our way of thanking you for your participation. Top scorers are listed in the Leaderboard, which is cumulative and includes all polling rounds. In most cases, this is because the password being entered is incorrect. You may reset your password. Alternatively, in your email records, find “Email account verified” message from registrar@visionprize.com. This email message contains your username and, for recent registrants, your password hint. Use this to confirm that you are using the correct information to log in. If these steps do not resolve your issue, please email Registrar. Click here to view profile and number of expert participants. This visualization — shows participants by position, affiliation (for those who registered with a professional vs. personal email account), and approximate location of their primary affiliation. See also: Leaderboard. Do incentives create selection bias? In addition to collecting and publicizing the distribution of beliefs of experts, we are also interested in prediction methods that might be more accurate than taking the mean or modal response of the group. In particular, the same research that provides our incentivized scoring system (Prelec, Science, 2004) also proposes an algorithm that harnesses the relationship between knowledge and meta-knowledge (accurate beliefs about the beliefs of others). Vision Prize is designed to provide an ongoing test of this approach.